The decade long lineage of the Gundam Versus games started out as a simplified reaction to SEGA’s more complex Virtual On. The latter required the player to keep an enemy’s position in their heads, as the camera would lose your target when you moved past them. In addition, the fixed vectored dashes made managing that even harder. The Gundam Versus games took this premise and distilled it down by removing the fixed vectored dashes and ensuring that the player could never lose sight of their target. What mixed it up was the addition of an extra opponent; two teams of two players a piece. Whilst the core mechanics were more accessible the additional enemy made combat more fluid. All of this was undertaken on a pretty standard arcade stick setup and what with the huge Gundam license attached to it, gamers piled in to play a game that was more immediately accessible but still interesting from a versus standpoint. Fast forward ten years to the present and the Gundam Versus games have changed dramatically. The accessibility the games once had has evolved into something far more involved and in many ways has gone back to a more discerning setup similar to that of the original Virtual On games. 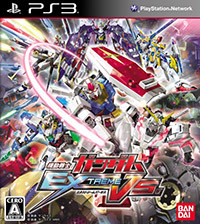 Either way, the latest iteration in the form of Gundam Extreme Versus is nothing short of an arcade versus thoroughbred. Following on from Gundam vs Gundam Next, the ability to boost dash cancel is still in effect. This means, if you have boost remaining, you can cancel out of pretty much anything. The difference now is that if you fully deplete your boost gauge you suffer a longer prone animation and in addition when landing you also are similarly vulnerable. Considering the rolling terrain in many of the arenas, you will almost always be landing at some point at the end of a boost dash. Ultimately this simple change has rendered the game far more tactical and more inline with the dash freeze seen in the classic Virtual On games. This is only one element though that defines Extreme Versus, the other is the wholly reworked step system. Historically, the Gundam Versus games worked around having circle strafe steps that allowed you to dodge incoming attacks as well as create openings of your own. It was simple and pretty effective. This system is fundamentally still in place but the big addition is the ability to cancel out of a step, which produces a lovely rainbow effect. This means what originally looked like an opportunity in close combat can easily turn into a deadly feint on the part of the “rainbow” cancel. Mastering this basic fundamental mechanic of the game is utterly necessary now. Coupling both these elements together means that not only does the game play very differently from its prior incarnations but that it is now a full blown and deeply complex versus game. Yet this is not the biggest addition to the game’s new mechanics. The Extreme Burst system harks back to the original “Awaken” setup and in addition to the various stat increases it affords it also fully replenishes your boost gauge on activation. Considering that both the boost dash and rainbow cancel use boost, this means you can be almost out of juice at a crucial moment only to have it refill entirely and get a substantial speed increase. Not to mention that many units already have a speed/performance boost ability on top of this, notably that of Trans-Am system from the Gundam 00 units, means that skilled matches can very quickly become a wonderfully intense rainbow hued blur. To make matters even more involved, there are swathes of intricate nuances hidden throughout the game. The roster, whilst smaller than Next’s, is still an immense undertaking as each unit has their own idiosyncrasies from the anime that birthed them. However, for those familiar with the multitude of host works, almost all of their respective functional interpretations are pretty damn implicit. As well as the full arcade mode in effect, the game has a very stable and compelling online setup available. Considering that this is the first time, not including the somewhat flaky PS2 USB modem iterations, that the series has had a fully international online versus mode this alone should be worth the price of entry. Not to mention the fact that being able to finally use a proper arcade stick again makes this game nigh-on worth its weight in a good few precious metals. The other pretty massive mode available is that of the Trial Mission setup. This is much like the mission modes from the previous Gundam Versus games and is as addictive and compelling. S-Ranking the entire mode verges on obsession at times but it’s never dull by any means. The upgrade system also never degenerates into a mindless grindfest either, which is normally an occupational hazard. Everyone took the piss out of the “extreme” name when it was announced in the arcades, but in truth it very accurately describes the game. Gundam Extreme Versus is subsequently a distillation of a decade’s worth of arcade versus brilliance. It’s almost an unfettered yet deeply involved arcade game that is on the one hand incredibly technical but on the other almost viscerally accessible. The fact that it can not only be played with an arcade stick as well as online, means that this is ultimately one of the finest Gundam Versus games yet made. It comes thoroughly recommended to all gamers that take arcade versus games seriously, as it also runs at a very fluid 60 fps throughout. From the Linkin Park accompanied opening movie to the sheer production value on display, Gundam games have finally come of age and to anyone that scoffs that this is a mindless license tie-in; just see if they can even keep up with your rainbow cancelling skills. This review was undertaken on a HORI Real Arcade Pro. 3 arcade stick as well as a Dual Shock 3 pad. I like the sound of the new cancels, should make for some interesting matches…. If I can ever master the technique! Maybe those custom stuff would be available as a DLC? Great review! I am super pleased to hear that it is involving, demanding, and full of strategic possibilities! Playasia here we come. see you guys online. 2. It probably will have a domestic release actually. I think almost every gundam vs has come out here. Minus the psp gundam vs gundam but I chalk that up to the psp’s lack of popularity stateside in general. I know PS3 is region free, but wouldn’t be better to have complete subtitles, the possibility of buying it only two steps out of your house and a lot more of people online? About 2 Gundam Vs titles came West versus 4 for the PS2 and maybe another 6 for the PSP. The online play in this is very, very solid. The little bit of input lag you experience playing other Americans can catch you off guard, but is a lot easier to compensate for in this game than, say, a 2D VS fighting game. And it’s a VO-like that you can play on a normal arcade stick, rather than special-ordering a $300+ limited edition controller for a single game. Hard to beat that! Would’ve been nice to have a LAN mode, though. I guess bringing a hub and hooking into the host’s Internet connection would work, too, but it’s a bit more obnoxious. I’m enjoying the CRAP out of this game, really (You should add me on PSN, would love to play with the MD crew). But there is definitely room for improvement where it was covered in Senki. Such as the online, the netcode is definitely more solid here, haven’t lagged yet in about 8 hours of online playtime. However, the online is somewhat skimped, no online Arcade for two players, no missions co-op and BGM edit only works offline. It’s an amazingly fun game, but it is not perfect. That probably explains the 9 out of 10. That 1 is definitely able to be gotten. Just got the game in, loving it so far. It’s mostly based either on specific events from various series, or themes. One of the Newtype level missions, for example, features the various “Big Brother” characters (Char, Shagia Frost, Neil Dylandy, and the Turn X, which Gym calls the Turn A’s big brother). Other themes exist as well, with about 200 missions and new free trial missions being patched in as part of the new unit DLC updates. No story mode as of yet, though. Just got the game on sunday. its amazing!! sloppysocksven07- psn add me! How can you play this game if it’s in Japanese? Does it have subtitles or is it just that the missions are so straight forward that you don’t need to worry about it? Oh, can you play it two players split-screen with a friend at home or is only multiplayer online?